Nutritional Therapy is a natural, evidence based approach using the latest scientific research to help people maximise their health potential. It is an individual centred approach focusing on eating or eliminating particular foods for therapeutic benefit. When we fall ill, our bodily systems are out of balance and this is represented by many different symptoms. A Nutritional Therapist works with the basic understanding that every client is completely unique and individual and so, no two cases are the same. As each individual has a different physiological make-up so does their dietary and nutritional requirements. 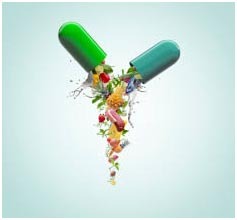 For thousands of years food has been used for its beneficial properties in the treatment of many chronic conditions. The initial consultation typically takes 1-1½ hrs. During this time a thorough and detailed case history will be taken, looking at past and current illnesses, family history of illness, past and current medications and current diet and lifestyle. Also during the consultation some non-invasive functional testing may be required such as tongue and nail analysis, and blood pressure. Your Nutritional Therapist will then work with you to discuss your aims and needs. An individual treatment plan will be devised for you with necessary dietary modifications and the inclusion of vitamin and mineral supplementation if required. The primary aim of a Nutritional Therapist is to give you, the client the necessary skills and knowledge required to achieve your own optimal health. At Nourish by Nature we provide the Lorisian Food Intolerance Test. This simple pin prick blood test is quick and easy to perform and involves drawing a small amount of blood from the finger. Your blood sample will be sent for laboratory analysis where it will be screened for intolerance’s to various foods. Laboratory testing is the only reliable scientific way of testing for food intolerances. People who have food intolerance tend to have two to three primary foods causing all their problems with a small number of secondary foods. This test is able to detect those primary problematic foods. The condition occurs when the digestive system is no longer able to process particular foods as they pass down the digestive tract. This results in a build up of many poisonous toxins, which then pass through into the bloodstream where they cause infection and inflammation in the body.